Four Star Leadership with General Tommy Franks is a world-class summer leadership program which provides 70 of the top performing high school students from around the country a life-changing educational opportunity. Selected students are hosted by Oklahoma Christian University on the campus in Oklahoma City and travel throughout the state on various excursions to meet and engage with national and international leaders including politicians, dignitaries, kings and sports champions. In addition, participating students are confronted with practical leadership and ethical scenarios and then challenged to address them individually in a persuasive speech and writing competition as well as collaboratively in an Ethics Bowl tournament. Attendees have the chance to earn more than $15,000 in scholarships as well as gain internships and receive letters of recommendation. All of this is provided a no cost to the student. The Four Star Leadership program is made possible through generous donations from individuals, organizations and corporations. 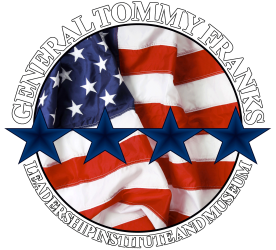 Your support gives the General Tommy Franks Leadership Institute and Museum the ability to continue to provide this valuable program to high school students for free. Please consider investing in our future leaders. Whether the gift is financial, resourceful or expertise, we value all of these donations as treasures invested in the lives of the next generation of leaders. Learn more information about how you can get involved and make a difference in the lives of young students.